In this feasibility study the authors describe and evaluate a word problem solving instruction, based on the principles underlying instructional programs like Solve it! and schema-based instruction. This instruction is executed during a five-week intervention period in a group of four less successful second grade word problem solvers. The effectiveness of the word problem solving instruction is reported by means of students’ performances on combine, change and compare problems before and after the intervention period, as well as by examining whether they executed the solution steps of the instruction correctly. This feasibility study provides important insights with regard to varying ways in which a word problem solving instruction can influence the solution strategies and performances of students who perform poorly on word problems. Tim, a seven-year-old boy who is in the second grade of elementary school, has difficulties with solving word problems like the one that is given in the example above. While solving these word problems, Tim of ten uses an impulsive, superficial solution strategy. Significantly, he only focuses on selecting the presented numbers (9 and 4) and identifying the relational keywords (more than), which subsequently form the basis for his mathematical calculations. Tim’s strategy of ten leads to an incorrect answer to the word problem. In this situation, Tim performed an addition operation where a subtraction operation was required, that is 9 + 4 = 13 instead of 9 – 4 = 5. the incorrect answer is not the result of a lack of calculation ability, but a result of a problem with deeply and correctly understanding the word problem text. Mathematical word problem solving plays a prominent role in the curriculum of contemporary approaches to teaching mathematics [1-4]. the solution of a word problem generally depends on two major phases: (1) problem comprehension, and (2) problem solution. the problem comprehension phase generally involves the identification and visual representation of the problem structure of the word problem. the identification and representation of the problem structure facilitates the correct understanding of the word problem text and helps distil the mathematical operation(s) that should be performed. In the problem solution phase, on the other hand, the mathematical operations to be used are identified and the planned computations are executed to solve the problem [5,6]. Hence, errors in word problem solutions frequently occur in the problem comprehension phase rather than in the problem solution phase. These errors are of ten ascribed to students’ insufficient reading comprehension skills . Next to difficulties in reading comprehension, the incorrect or incomplete visual representation of the problem structure is a common factor of influence when it comes to the correct understanding of the word problem . Improving students’ problem representation skills is therefore of pivotal importance in order to help them master these word problems. As mentioned above, the production of visual representations should be a key element in word problem instruction. However, it is important to look closely at the characteristics of these visual representations. Visual representations should contain the correct relationships between numerical and linguistic elements of the word problem text and give a complete and coherent representation of the problem situation. These types of visual representations are of ten referred to as ‘visual-schematic’ representations . the construction of this type of representation differs from that of the pictorial representations of ten described in the literature, as the latter rely on the use of vivid and detailed images focusing on one element of the word problem text [9,10]. In the remainder of this article, we will describe the outcomes of a word problem instructional program that focuses on the production of visual-schematic representations. This word problem solving instruction was primarily based on two commonly reported instructional programs, namely the Solve it! instruction program and the schema-based instruction [11-14]. the solution steps that were part of both of these instructional methods were merged and adjusted. It should be noted that this instruction was tested in a small group of four unsuccessful word problem solvers who attended the second grade of a mainstream elementary school. Students from this particular grade were used as subjects because difficulties in solving word problems already arise at an early age (see the example of Tim mentioned above) . the instruction was especially focused on the three word problem types that play a prominent role in the lower grades of elementary school, namely combine, change, and compare problems (see table 1). Combine Mary has 5 marbles. John has 8 marbles. How many marbles does John have more than Mary? Change Mary had 2 marbles. Then John gave her some marbles. Now Mary has 9 marbles. How many marbles did John give to her? Compare Mary has 5 marbles. John has 8 marbles. How many marbles does John have more than Mary? Table 1: Examples of combine, change, and compare word problems. Step 5: Draw a circle around the variable that had to be calculated in order to check if the required solution was reported. Step 1: the combine problem is read aloud twice by one of the students. Step 2: Students are taught to visualize the problem structure of the combine problem by making an external visual representation. the three marbles that Mary has are drawn first. Next, the five marbles that John has are drawn (see figure 1). 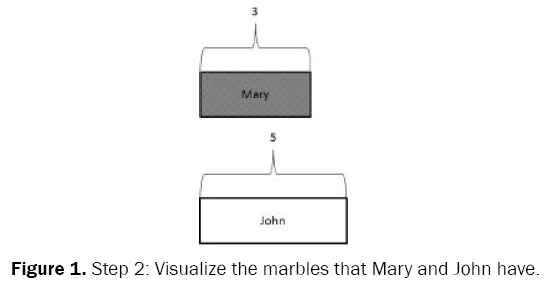 Figure 1: Step 2: Visualize the marbles that Mary and John have. Step 3: A question mark is added to the visual-schematic representation to indicate the ‘unknown’ value that should be calculated (see figure 2). Figure 2: Step 3: Add a question mark to the visual-schematic representation to indicate the variable that has to be calculated. Step 4: the required mathematical operation is written down (3 + 5 = ) and solved (3 + 5 = 8). Step 5: A circle is drawn around the ‘unknown’ value (i.e., 8), to be sure that the required answer is reported (see figure 3). Figure 3: Step 5: Draw a circle around the variable that had to be calculated. The instructions for change and compare problems were executed in a similar way taking the respective characteristics of each type of word problem into account. After five weeks of instruction the overall performance of the students on a nine item word problem solving test improved reasonably. This improvement was mainly caused by a reduction in the amount of errors resulting from the incorrect comprehension of the word problem text (i.e., the comprehension phase). Before the instruction period students encountered the following difficulties: they distilled the incorrect mathematical operations from the word problem text; they had difficulties finding the required answer; or, they just performed an addition or subtraction operation with the known figures in the word problem without carefully understanding and identifying the problem structure. After the instruction period most of these difficulties disappeared. Two students omitted making errors on the combine, change, and compare problems completely. Two other students, however, improved their performances on two of the three types of word problems. Therefore, we can only tentatively conclude that the improvement of their performance can be ascribed to the word problem solving instruction. With regard to the correct use of the five-step solution process of the instruction, we observed that most students were able to execute all the steps. Nevertheless, one of the four students seemed to have difficulties executing the visualize-step. This indicates that not all students are able to follow the instructions exactly, and that teachers should take students’ individual differences into consideration when solving word problems. Teachers should, for example, learn to notice the errors that students make, flexibly switch between the solution steps, and adapt their instruction to the preferences and educational needs of their students. Nevertheless, these outcomes suggest that the instructional program described in this article marks an important starting point in the search for instructional programs that could be implemented in the educational practice of contemporary math approaches where word problem solving plays a prominent role. H. Barnes. the theory of Realistic Math Education as a theoretical framework for teaching low attainers mathematics. Pythagoras.2005; 61: 42-57. I. Elia, et al. Exploring strategy use and strategy flexibility in non-routine problem solving in primary school high achievers in mathematics. ZDM Mathematics Education. 2009; 41: 605-618. K. Gravemeijer and M. Doorman.Context problems in realistic mathematics education: A calculus course as an example. Educational Studies in Mathematics. 1999; 39: 111-129. M. van den Heuvel-Panhuizen.The didactical use of models in realistic mathematics education: An example from a longitudinal trajectory on percentage. Educational Studies in Mathematics. 2003; 54: 9-35. J. L. Krawec. Problem representation and mathematical problem solving of students with varying abilities. (doctoral dissertation, University of Miami) Miami (2010). A. B. Lewis and R. E. Mayer.Students’ miscomprehension of relational statements in arithmetic word problems. Journal of Educational Psychology. 1987; 79: 363-371. A. J. H. Boonen, et al. What underlies successful word problem solving? A path analysis in sixth grade students. Contemporary Educational Psychology. 2013; 38: 271-279. A. J. H. Boonen, et al. the role of visual representation type, spatial ability, and reading comprehension in word problem solving: An item-level analysis in elementary school children. International Journal of Educational Research. 2014; 68: 15-26. M. Hegarty and M. Kozhevnikov. Types of visual–spatial representations and mathematical problem solving. Journal of Educational Psychology. 1999; 91: 684–689. D. van Garderen and M. Montague. Visual–spatial representation, mathematical problem solving, and students of varying abilities. Learning Disabilities Research & Practice. 2003; 18: 246–254. A. K. Jitendra, et al. An exploratory study of schema-based word problem solving instruction for middle school students with learning disabilities: An emphasis on conceptual and procedural understanding. the Journal of Special Education. 2002; 36: 23–38. A. K. Jitendra and J. R. Star. An exploratory study contrasting high- and low achieving students' percent word problem solving. Learning and Individual Differences. 2012; 22: 151-158. A. K. Jitendra, et al.Improving seventh grade students’ learning of ratio and proportion: the role of schema-based instruction. Contemporary Educational Psychology. 2009; 34: 250-264. M. Montague, et al.Solve It! strategy instruction to improve mathematical problem solving. Learning Disabilities Research & Practice. 2000; 15: 110-116. D. D. Cummins, et al. the role of understanding in solving word problems. Cognitive Psychology. 1988; 20: 405-438.